RACV Torquay Resort is an award winning wedding venue situated on the iconic Great Ocean Road. It can seat up to 270 guests banquet style comfortably in the Great Ocean Road Ballroom. Set within the backdrop of the Torquay and Jan Juc beach, RACV Torquay Resort owns an expansive golf course with spectacular ocean views and direct beach access. 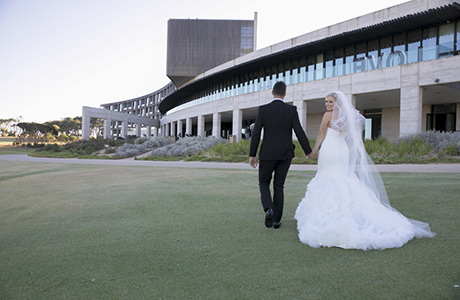 It is truly a perfect venue for your wedding ceremony and reception RACV Torquay Resort also offers the terrace area for the wedding ceremony. It has the full height glass atrium on one side and the striking panoramic backdrop on the other side. RACV Torquay Resort has the diverse opportunities for wedding photography. 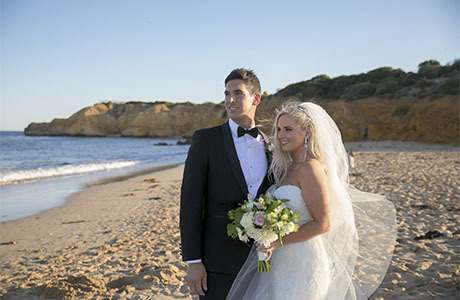 The sweeping golf course with the beautiful golf cart, the stunning ocean views from Jan Juc through to the Torquay beach, the stylish architecture with the modern decor are just a few options for bride and groom to take their wedding photos. The fantastic accommodation, bridal treat, spa, golf and other resort facilities onsite can pamper you and your bridal party from the morning. With everything the bride and groom need all stay within RACV Torquay Resort, it will allow your wedding day run seamlessly and stress free. Our wedding photographer and inematographer will take that ease and elegance to make your wedding day into the most memorable day in your life. From a Melbourne wedding photographer’s perspective, RACV Torquay Resort is one of our favorite wedding reception venue. Should you have any questions to plan a wedding at RACV Torquay Resort, please do not hesitate to contact us for the suggestions and information from a wedding photographer’s view.